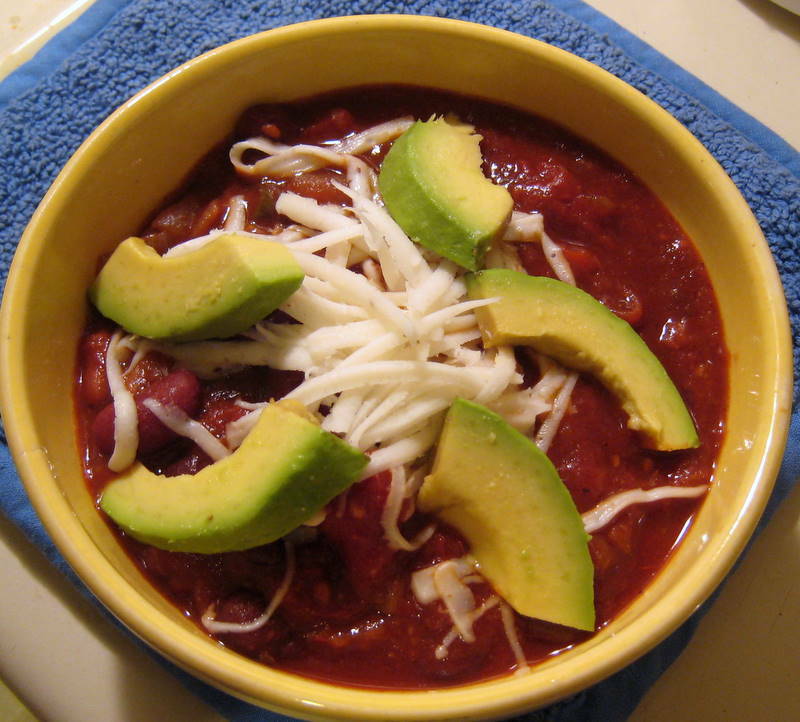 This is a slight twist on Stef’s Family Secret Chili. Soooo tasty! 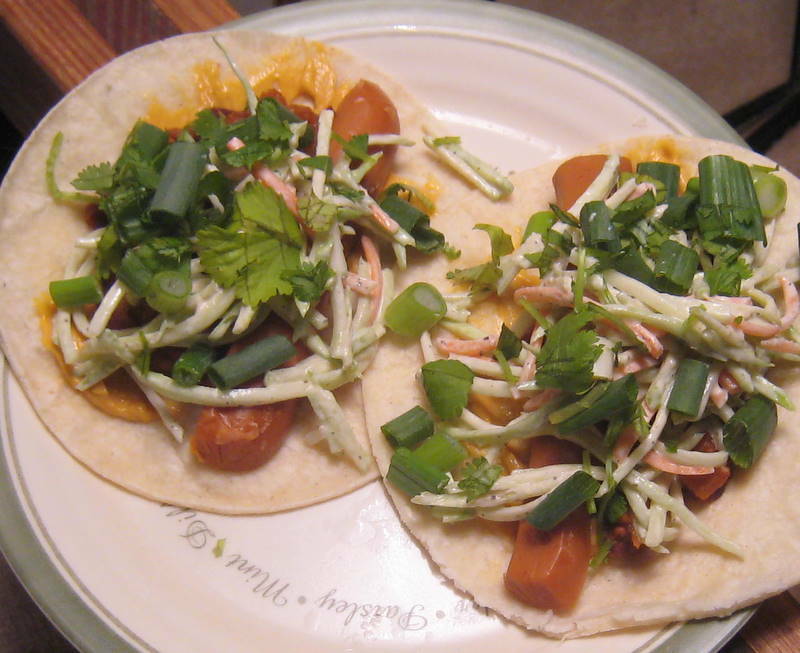 Top it with gucamole and green onions or plain soy yogurt mixed with lime juice. Bake small Yukon potatoes at 400 for about 40 minutes (longer if they’re a bit larger). 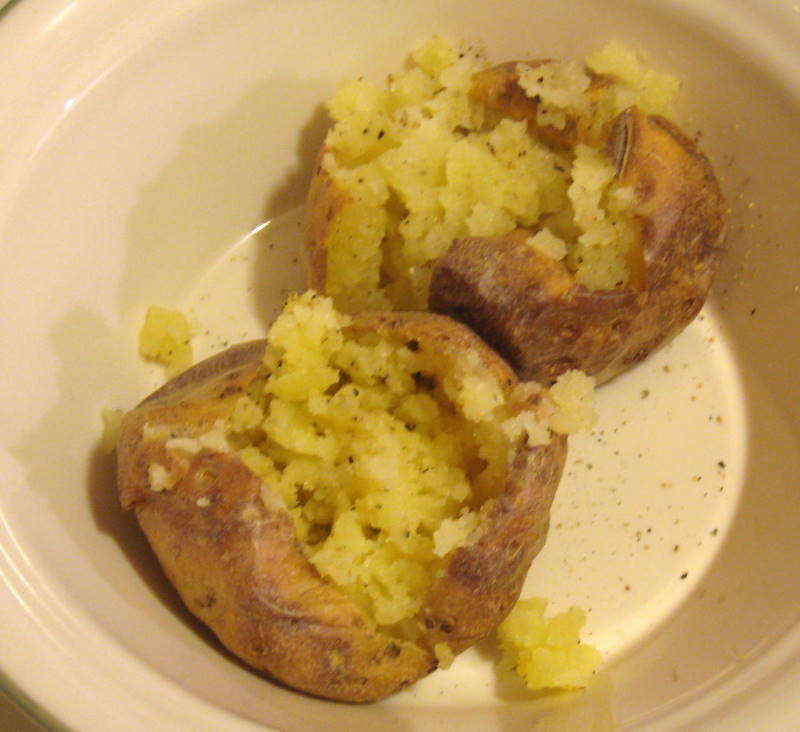 Let the potatoes sit in the oven for 5-10 minutes, then slice open and mash with Earth Balance, salt, and pepper. 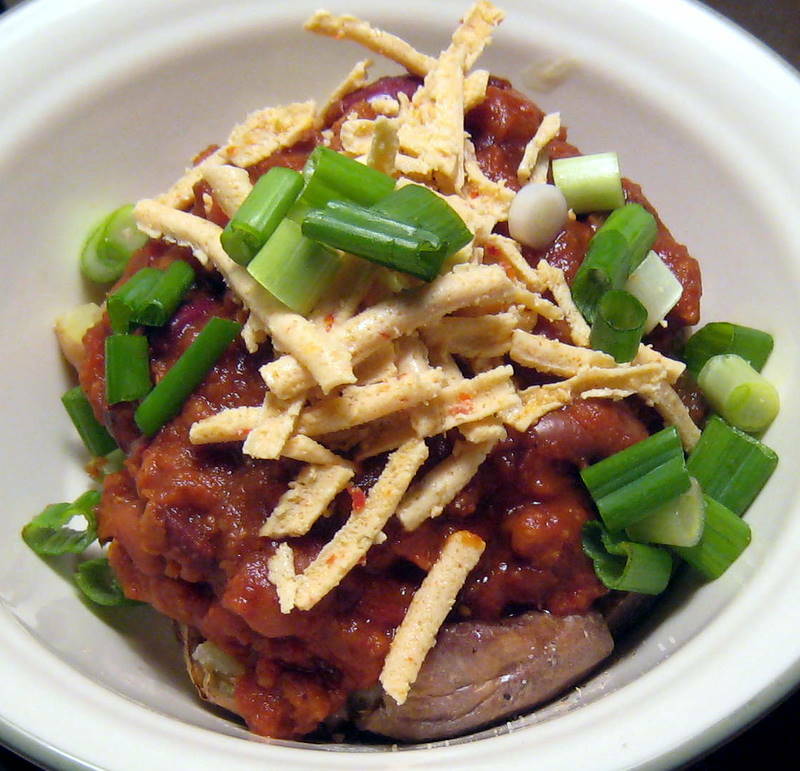 Top with family-secret chili, pepper-jack Daiya, and green onions. Full disclosure, we’re still catching up on blog posts. Stef isn’t here right now, and I didn’t actually make this chili (but I ate a lot of it), so if there are errors, I will correct them when she’s back. Topped with Daiya. Or DAAAAMMMMNNN as we call it around here. 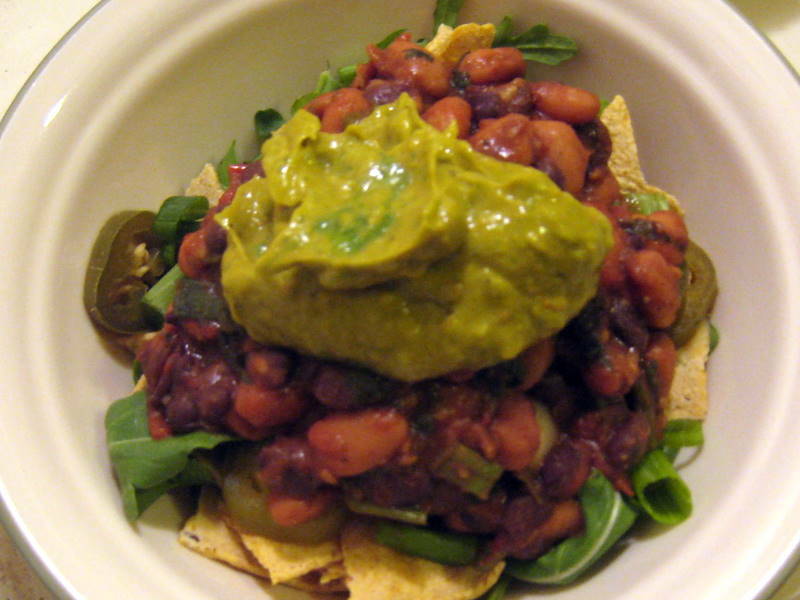 This is Stef’s family recipe adapted for the modern gal. In a 8 qt stock pot (or 5 qt will just fit if you are careful), saute gimme lean, then add the onion and pepper and cook until soft. Add the remaining ingredients in the order listed. Stir and cover. Simmer for 2 hours (minimum). The longer it cooks, the more flavorful it becomes. Ideally make it the night before, or make it, freeze, and thaw it again. Goes well with cornbread. We eat variations of this dish all the time, but that’s because it’s so good! 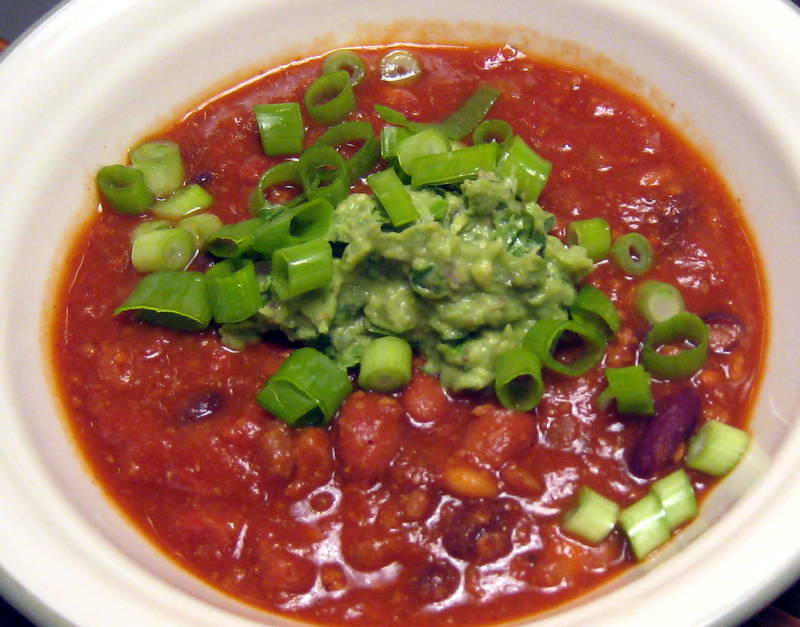 Who can get enough of homemade chili and guacamole? For an extra special touch, we added green onions to the guac, and pickled jalapenos. The chips are just baked corn tortillas. 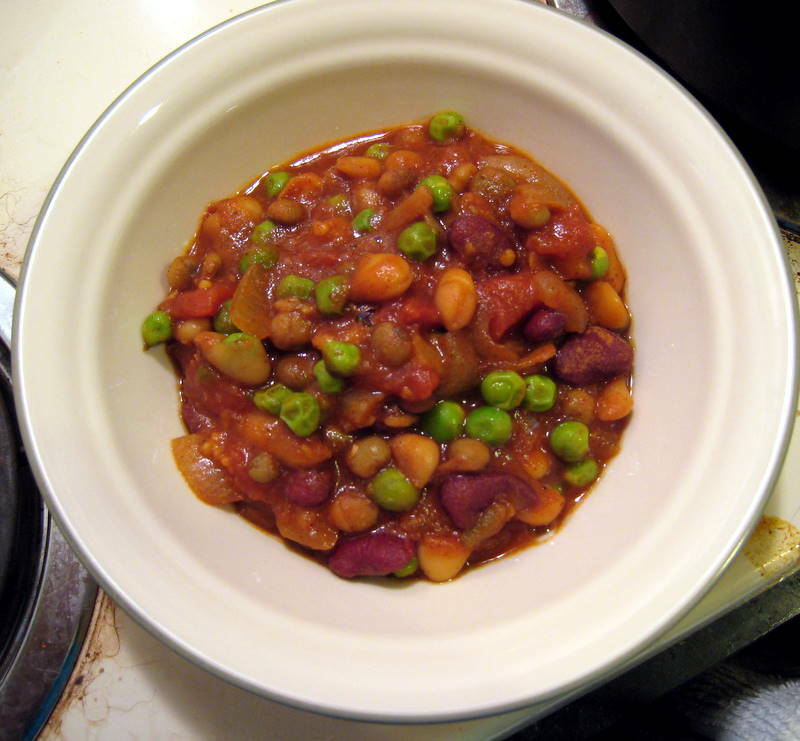 We saw this recipe for crockpot lima beans and having neither dried lima beans, nor a crockpot, here is our somewhat related recipe for two-pea, two-bean vegan chili. The smoked paprika really makes it special. In a dutch oven, heat olive oil and sauté onion, jalapeno, and garlic. Season with salt and pepper and saute until onions become translucent, 5-7 minutes. Add spices and pineapple. Saute 2 more minutes. Add tomatoes and kidney, white beans, and pigeon peas. Add broth and bring to a boil. Cover and cook on medium low for 30-40 minutes. Uncover and add fresh green peas. Cook on low for additional 20 minutes uncovered. 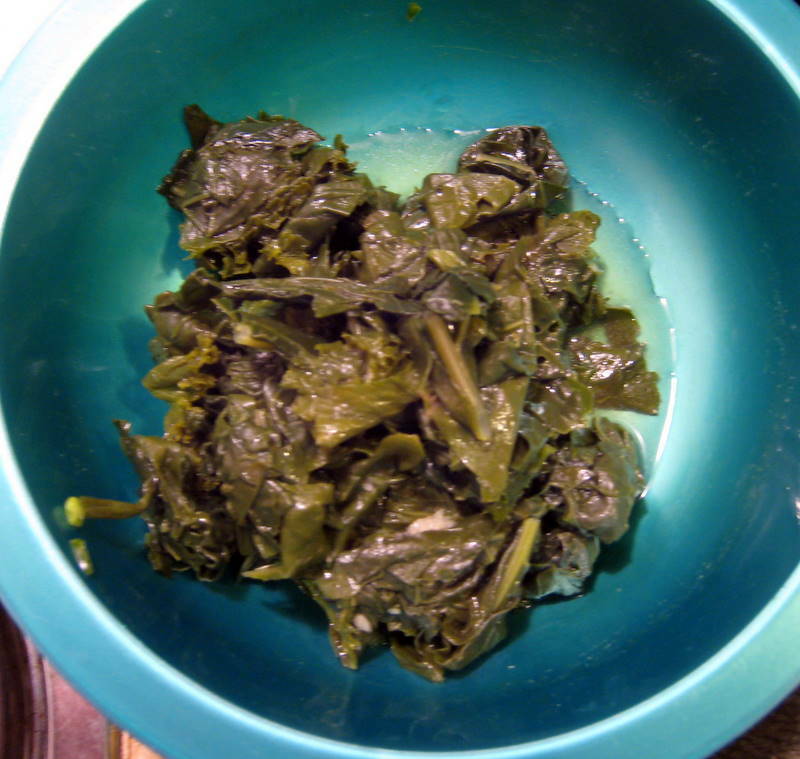 Serve with cooked greens (we had a combination of kale, turnip greens, and collards cooked with garlic, salt, pepper, and Earth Balance). We haven’t made chili in over a year. I don’t know how that’s possible, but here we are on the snowiest day of the year. The snow reports vary, but from our walkabout today, I’d say we have about 5-6 inches, which for Chapel Hill is a lot. So far, we walked to Wholefoods to buy some ingredients for Taymer’s (Vegan in the Sun) recipes, then walked around in the cold, drove around town a little, then hit Harris-Teeter for fancy beers, and finally back home again. 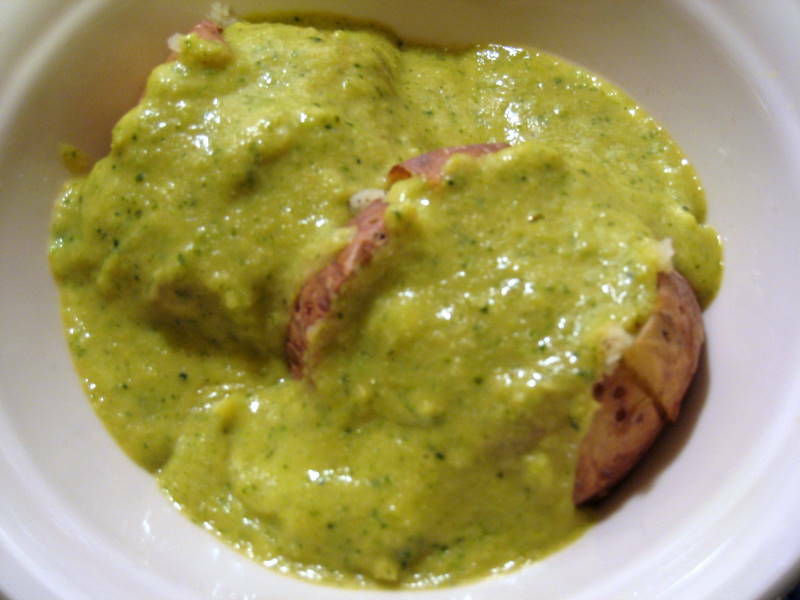 Unfortunately, Caribbean food didn’t seem as enticing after rosy cheeked snow hikes and icey driving, so we put away our pineapple and coconut milk, and took out ingredients for chili and baked potatoes with vegan broccoli cheese sauce. 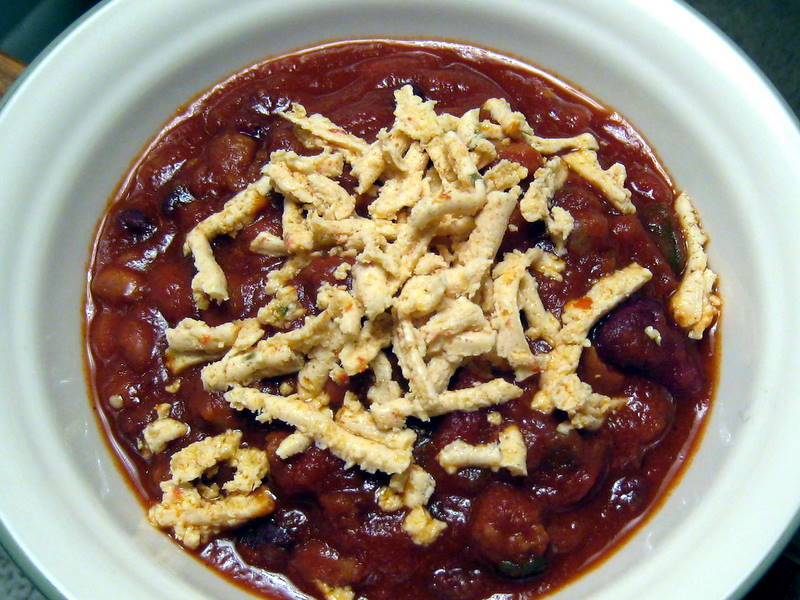 The chili is similar to one we made a year ago, but without the tofu and a few tweaks to the ingredients. In a large pot, sautee the tofu in 1 TBL olive oil over medium high heat for about 3 minutes. Add the onions, green pepper, garlic, mushrooms, chili powder, salt and pepper, cayenne and cumin. Cook until veggies are just barely tender, about 5 minutes. Deglaze the pot with a little water, if needed. This sauce is so good that we ate the leftovers with a spoon like a soup. In a pot, mix all ingredients except cornstarch and bring to a boil. Turn off heat and blend with an immersion blender. Return heat to medium and add cornstarch. Stir continuously until the sauce has thickened, about 5 minutes.